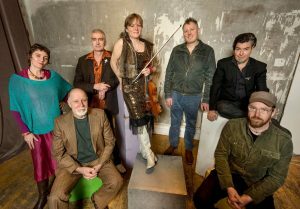 Lighting up the stage with joy and verve has always been Shooglenifty’s usp, but with new fiddler in the shape of pint-sized fireball Eilidh Shaw they’ve upped the ante. After a summer of well-chosen festival appearances and a new album release, the Edinburgh-based Acid Croft pioneers are in sparkling form. The band will be showcasing some electric new tunes and a full-on set of old favourites. In 2015 they played venues in Sarawak and Stornoway, Lorient and London, Adelaide and Aberdeen, Bangalore and Bristol, and released their seventh studio album The Untied Knot. This featured the first ever collection of Shoogle songs and introduced their newest member, puirt à beul vocalist Kaela Rowan. It received a 5* ‘Top of the World’ rating in Songlines, among many other favourable reviews. Songlines also nominated the band for Best Group in early 2016. The Untied Knot was nominated for Best Album at ‘Na Trads 2015’ – the Scottish Traditional Music Awards.